Thank you Tracy Lyman for sponsoring this post and keeping it free for my readers. An energizing green drink that has Slim ‘& Sassy essential oil in it to provide a satisfying and natural appetite controlling beverage. If you love smoothies, you will love this FREE webinar for making healthy smoothies the whole family will love! By now you guys probably know how much I love drinking a smoothie in the mornings. It is one of my favorite ways to start the day, and it is even better when it has lots of good for me stuff in it. I recently started trying out dSlim & Sassy® essential oil made to manage appetite between meals, which for a food blogger like me is a big deal. I am constantly snacking. This oil is a blend of grapefruit, cinnamon, lemon, peppermint, and ginger essential oils, and you are supposed to take 3-5 drops of it 3-5 times per day. The problem for me is I don’t love how it tastes in water. I much prefer a wild orange or lemon oil in water. So I was trying to decide how to incorporate it in my day without taking it in a gel capsule, since I don’t love swallowing pills. This smoothie was my solution. I call it my Slim ‘n Energizer green drink. I make a big old blender full in the morning, and then drink it throughout the day, especially when I need a pick me up or something to satisfy a craving. To make it a quick and easy on-the-go solution, as my life is always busy, hectic, and on-the-go, I simply put it in these mason jar mugs, and screw the lids on, that way it is already portioned out for me, and I can give it a quick shake and drink whenever I need to! I like this combination as there is no one predominant flavor, and it kind of masks the strong flavors of the oil. But you can adjust it to whatever best fits your personal preference. Smoothie and drink making is a great way to incorporate essential oils, and right now you can sign up for this FREE webinar on making Smoothies! It will be held on Monday, Mar 30, 2015 7:00 PM – 8:00 PM MDT and you do not want to miss it! 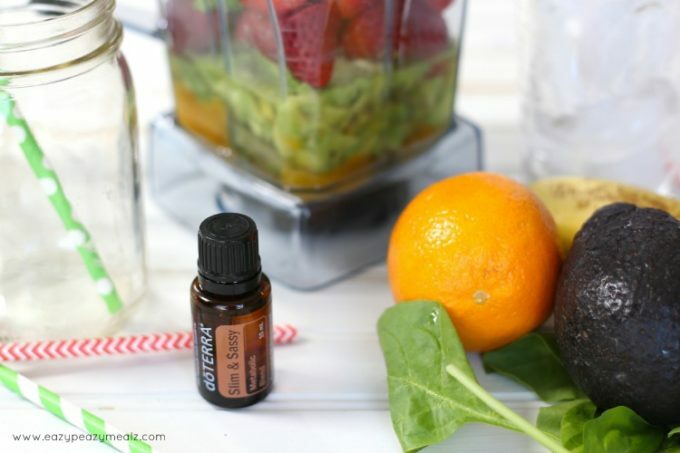 And remember, Slim & Sassy is a great addition to a smoothie, but other oils also work well, so try another fruit oil, or give this Wild Orange Colada a try. Sounds yummy, where do I find the slim n sassy essential oils?